It’s time. With summer around the corner, Sugar Mountain – Melbourne’s beloved music and arts festival – is back, and it’s time to reveal another tantalising, boundary-pushing line-up. Sugar Mountain returns on Saturday 20 January 2018 to its home at Victorian College of the Arts, expanding the footprint to also encompass the neighbouring ACCA and the Melbourne Arts Precinct. 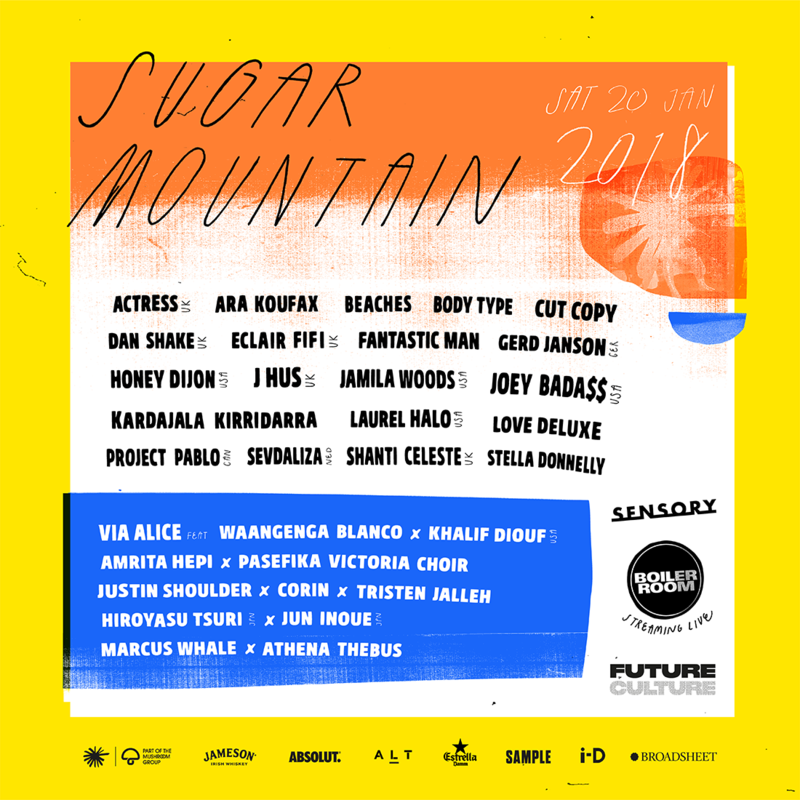 Featuring international game-changers alongside Australia’s finest, 2018’s event is packed with the very best cutting-edge music and immersive visual artists you’ll find anywhere – it’s peak Sugar Mountain. Limited First Release tickets to SM 2018 are on sale now at a special first day only price of $109 – buy here. Prices go up tomorrow, so get in early. A Sugar Mountain debut from one of Melbourne’s most seminal artists this side of the millennium and off the back of a cracking new album: Cut Copy. It’s set be a massive appearance from red hot ‘Devastated’ rapper Joey Bada$$ (USA); rising Chicago R&B star Jamila Woods (USA) makes her much awaited Australian debut. Coming in the black Benz, leaving in the white one is Mercury Music Prize nominee and London rapper J Hus (UK), who will deliver cuts from his excellent LP Common Sense; expect intensity from beatsmith Actress (UK). Experimental pop prodigy Laurel Halo (USA) will deliver a set from Berlin-by-the-way of Michigan; Chicago DJ/icon Honey Dijon (USA) will bring the heat in spades. Get ready for Gerd Janson, one of the most highly respected DJs in the world of house and techno. Locals Beaches, Body Type and Stella Donnelly are hotly tipped; as is London trailblazer Dan Shake (UK) and Scottish DJ/producer extraordinaire Éclair Fifi. Montreal tastemaker Project Pablo (CAN) will get it popping; it’s Sydney’s summer jam maestro Love Deluxe; and Melbourne’s own Ara Koufax. Witness the magic of all-female, ‘NT Song of the Year’ winners Kardajala Kirridarra; and Iranian-born, Dutch-based pop auteur Sevdaliza (NED). Certified immense-vibe-supplier Shanti Celeste (UK) and selector extraordinaire Fantastic Man round out the fun. Staying true to the vision that shaped the festival’s early formative years, SM 2018 brings together a multitude of artists and mediums, featuring a selection of unique collaborative projects, and performances. VIA ALICE features dancer/choreographer Waangenga Blanco (Bangarra Dance Theatre), and New York artist/producer/dancer Khalif Diouf (Le1f). Its debut earned a ★★★★ review from the Sydney Morning Herald: a moving meeting of two worlds, part virtual reality/part live audio/dance performance. Dancer and choreographer Amrita Hepi will team up with Pasefika Victoria Choir to bring us a contemporary Waiata celebrating cultural resistance. Performance, sculpture, video and production genius Justin Shoulder collaborates with classically trained electronic artist CORIN and digital video artist Tristan Jalleh (who has created videos for the likes of Oscar Key Sung); painter/sculptor/artist Hiroyasu Tsuri, aka TWOONE (JPN) will join artist, friend and collaborator Jun Inoue (JPN) in a physically performative artist exchange. First joining us as the opening performance of Sugar Mountain 2011, songwriter Marcus Whale (also of BV and Collarbones) returns with new music, a collection of live players, and goes head to head with the multi-disciplinary artist and rising talent Athena Thebus. Arrive via the Sturt St festival entrance and SM 2018 reveals itself afresh, as we’ve introduced an expanded site and key new spaces. Expect the same ease of access and amenities that Sugar Mountain always nails. Indoor venues include the Grant Street Theatre and Margaret Lawrence Gallery. For the first time ever, SM will expand into the Australian Centre for Contemporary Art (ACCA) footprint, and take over Grant Street (the area between). Plenty of green and new places to discover. Sugar Mountain’s acclaimed immersive restaurant experiment is back, and the 2018 offering will be a love note to the real MVP… dessert. The new-look Sensory will be light-hearted and fun, coming to you in collaboration with one of the absolute benchmark eateries in Australia. You can book your Sensory add-on at the same time as your festival ticket, which is recommended if you don’t want to miss out – tickets are on sale here. Stay tuned for full info revealed soon! Boiler Room, the global cultural phenomenon makes its very welcome return to Sugar Mountain in 2018 for another huge broadcast. With the stage newly relocated to a new location, expect the same intimate vibes, sunshine and easy access. And as the only Australian festival (one of only eight worldwide) to be broadcast live to BR’s global audience, who knows who’ll be watching. Time to polish those moves. SON LUX sign to City Slang & announce album ‘Brighter Wounds’ for Feb 9th + live dates. Hear new track “Dream State” now.